Antibacterial, antifungal and antiviral. The fragrance of this Organic Tea Tree Essential Oil is a little more complex than the conventionally cultivated variety, with more herbaceous and woody notes, and slightly less harsh, camphoraceous overtones. Inhaling the oil directly from a tissue helps clear a stuffy nose and catarrh whilst protecting against viral infections. Organic Tea Tree Essential Oil protects against bacteria, viruses and fungi, and there are very few natural substances in the world that can claim to active against all three of these categories of infectious organisms. It is also an effective immunostimulant, so all of this in combination with the fact that it is gentle on the skin explains why tea tree oil is so versatile, effective and popular. If you only ever intend to invest in just one essential oil for your first-aid kit, you should make it this one. When you feel a head cold coming on, add a few drops of Organic Tea Tree Essential Oil to a hot bath or gargle to soothe a sore throat and help keep infection at bay. 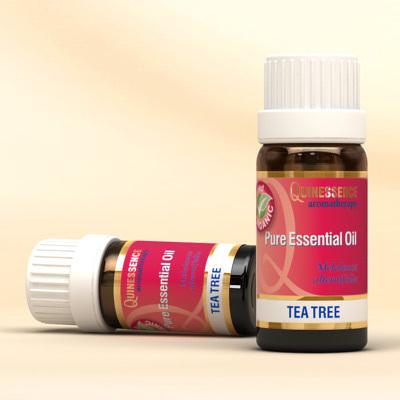 This oil is recommended for the treatment of candida and thrush when it is used in douches or baths, and one drop neat in an emergency delivers a soothing effect on insect bites, cold sores and cuts etc. In research, Tea Tree Essential Oil has been proven to be just as effective as benzoyl peroxide in successfully treating acne – but without causing any of the side effects usually associated with this chemical. Research has also shown that the antifungal properties of tea tree oil are effective against toenail onychomycosis, athlete’s foot, and ringworm. Add organic Tea Tree Essential Oil to a base carrier lotion to bring relief to these conditions.